Logitech Revue announced as first Google TV box | What Hi-Fi? 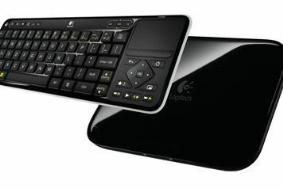 The Logitech Revue with Google TV will go on sale for $300 and comes with a keyboard controller. Connect the Revue box to your TV – via HDMI – and to the internet, and you're ready for Google TV. The box aims to integrate your existing off-air TV content with internet content and applications, with the keyboard allowing you to search across all platforms. The Revue is out in the US this month and will come with access to the Netflix streaming movie service, Napster for music, and apps for sites such as Twitter and Pandora. The box has an HDMI input – for connecting a set-top box – and an output – for connecting to your TV – plus two USB connections, a digital optical audio output and support for wired or wireless networking. There's no word on a worldwide release date or prices as of yet but we'll be sure to give let you know as soon as we do. Sony is expected to announce its own Google TV products, included enabled-TVs, next week.